1. 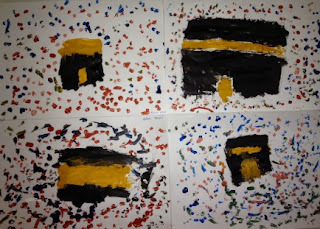 I showed the children photographs of the Ka'bah and asked them what the shape of the Ka'bah is. They know it is a square as we have done shapes earlier on in the year and they can all draw a square. 2. 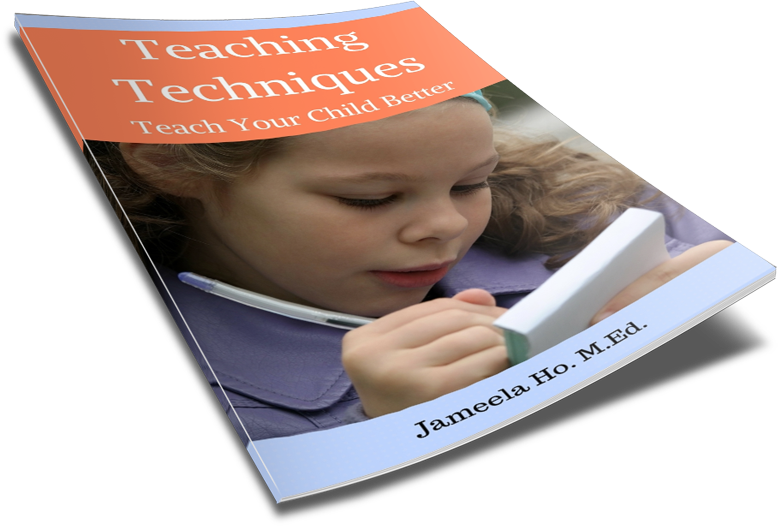 Have the children use a pencil to draw a large square in the middle of a white sheet of art paper. Then draw in the door. 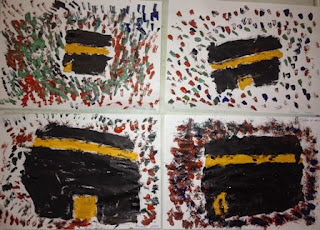 Tell the children that the Ka'bah doesn't have windows so we don't draw in the windows but we draw two lines across the top of the Ka'bah. 3. Distribute yellow paint and ask the children to paint the door and in between the 2 lines in yellow. 4. 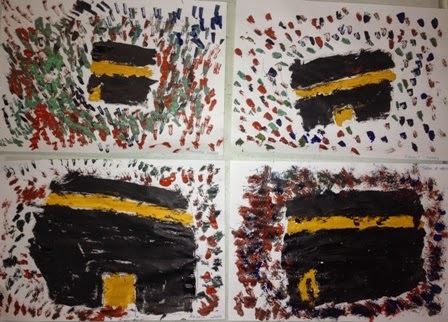 Hand out black paint and ask the children to paint the rest of the Ka'bah black. 5. Look at the photograph of the Ka'bah and tell the children that to paint the people going around the Ka'bah they are going to use a cotton tip dipped in paint and then dot paint around the Ka'bah. Hand out one colour at a time, for example, red dots first, then blue, then green etc. Initially, I had planned to print out a square template for the children so all they needed to do was to paint in the square into the Ka'bah. 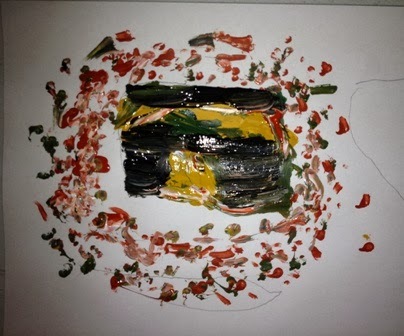 But then I thought if I did this then their painting would look too uniform. I wanted each painting to look unique. 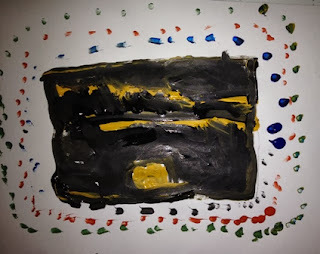 So allowing the children to draw their own squares it made all the difference. From the above photo you could see that each square was drawn differently and in different sizes. Some children don't like to dot a lot. One child didn't like to put random dots but rather put the dots in an orderly manner. Each one a highly personalised painting.